Two Fusion-IR packs are available for Reverberate 2, one with all presets from the Bricasti M7 and Factory Set 1 taken from a range of modern and classic reverbs. Both are made available free of charge. The Bricasti M7 is a highly prized true stereo reverb processor, widely considered to contain some of the best synthetic reverb algorithms to date, and has been captured for multiple impulse response packs freely available online. Commonly only the first bank of algorithms are available (the version 1 algorithm), although a newer second generation algorithm is available that features a higher degree of modulation. Both have been captured for the LiquidSonics M7 Fusion-IR preset pack. Due to the nature of the various sources of modulation within the M7 algorithms, the commonly used reverb impulse response sampling approach (typically swept-sine) has the effect of averaging away all of the modulation that is key to much of the character of the M7. This is suitable for a static convolution processor, but the Fusion-IR sampling and processing approach takes multiple snapshots in time of the device and processes them concurrently so is able to much more closely reproduce the character of the original device as it varies over time. A new impulse response pack from LiquidSonics – Factory Set 1 (FS-1) provides a highly musical set of Fusion-IRs taking advantage of the new modulated processing capabilities within Reverberate 2. You may download Fusion-IR installers for Windows or OS X. 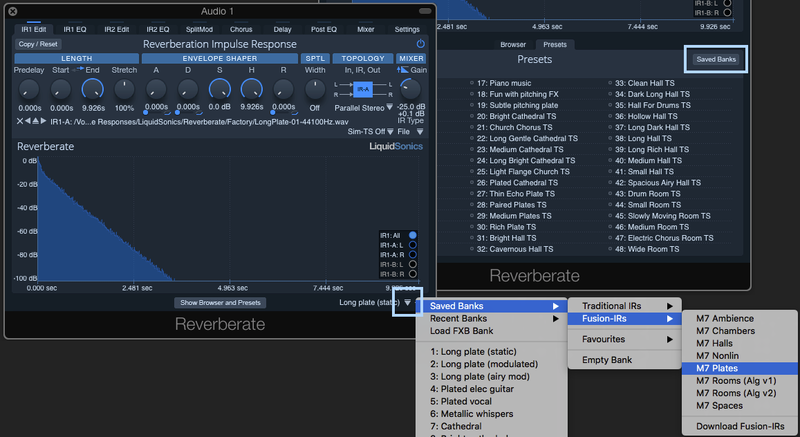 Once you have downloaded and installed the Fusion-IR files they will be available for use in Reverberate via the saved banks menus (see below). Reverberate 2 resamples Fusion-IRs up or down to the correct rate for your project, but you should choose a sample rate format at least as high as the rate you are using in your DAW (if you are planning to use these files now or in future projects above 44 kHz, use the 96 kHz files). Install Reverberate and then run the Fusion-IR installer(s) for the files you wish to install. The installer will guide you through installation of the AAX and VST presets, and allow you to select your preferred installation folder for the Fusion-IR files (which may be on a different disk to the Reverberate installation). It is recommended not to store the files on a networked drive to improve performance. Install Reverberate and then run the Fusion-IR installer(s) for the files you wish to install. The installer will allow you to select either or both of the AAX and/or the AU/VST presets, in addition to the required Fusion-IR data files. You can move the entire FIR folders to a new location with Finder. Reverberate will ask for for the location of the files when loading a bank (it should remember this location on subsequent loads). You may also wish to configure a recursive search path (see the User Guide) to avoid such prompts before attempting to load any banks. Instructions for accessing the Fusion-IR presets is given for AAX and VST/AU hosts. 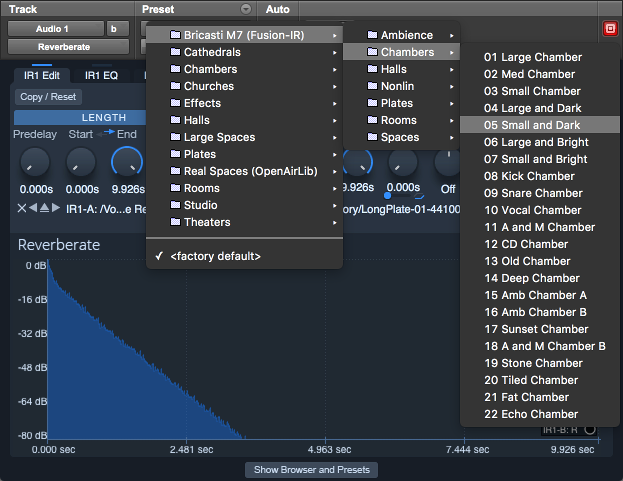 Once the Fusion-IRs and presets have been installed select them from the Pro Tools plugin preset menu. Once the Fusion-IRs and presets have been installed select a bank from the preset selection menu (when collapsed) or from the “Saved Banks” menu (highlighted below).